March 4, 1865. 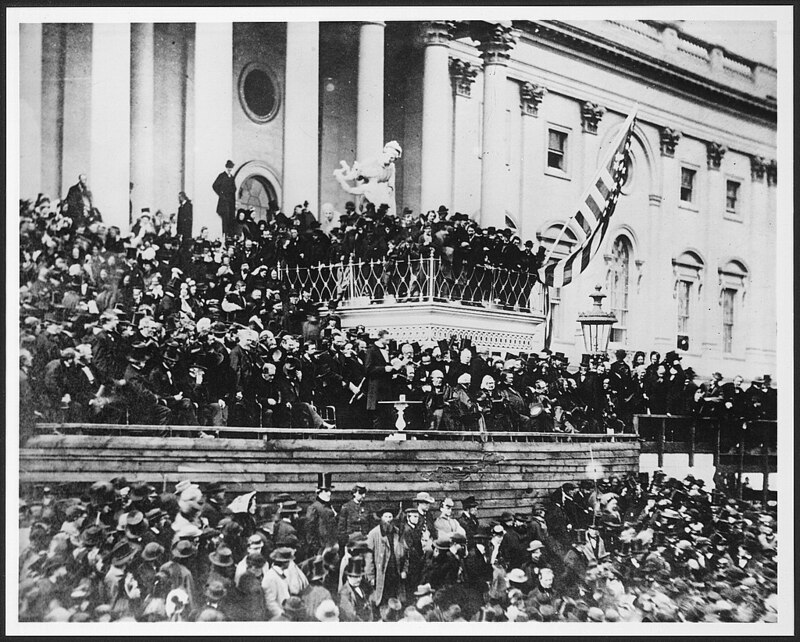 Lincoln delivered his second inaugural address on the east steps of the capital building. A photo of the event shows John Wilkes Booth standing in the audience not far from the President. Newspaper reporter Noah Brooks observed, “But chiefly memorable in the mind of those who saw that second inauguration must still remain the tall, pathetic, melancholy figure of the man who, then inducted into office in the midst of the glad acclaim of thousands of people, and illumined by the deceptive brilliance of a March sunburst, was already standing in the shadow of death. Lincoln’s Second Inaugural, March 4, 1865. “In a print made about 1920 from an original photograph by Alexander Gardner, President Lincoln is seen reading his inaugural address before the crowd on the east portico of the Capitol. This is one of three photographs taken March 4, 1865, by Alexander Gardner. Above Lincoln, to the right and behind an iron railing, stands John Wilkes Booth, though he cannot be seen clearly in this photograph. In only one of the photographs, that in the Meserve Collection in the National Portrait Gallery, is Booth visible. He has a mustache and is wearing a top hat. Five of the other conspirators in Lincoln’s assassination stand just below the president. Looking at a detail of the figures behind the railing in the photograph presented here reveals a man with a mustache holding a top hat in his hand who could well be John Wilkes Booth. 1.) Harold Holzer, Lincoln in the Times pp. 221-2. Did Booth Attempt Lincoln’s Assassination on Inauguration Day?